One of my recent posts was about Paul Nicklen’s National Geographic presentation on Tuesday, March 4th, at Kleinhans, in Buffalo. My own favourite images? Well, I’m going to list the page numbers but there’s a very high chance that your favourites would be different to mine, as they undeniably should be, because we all have different likes. 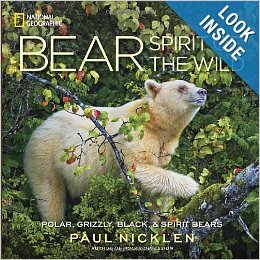 Whether or not you are going to Paul Nicklen’s talk in two days’ time — which is not all about bears — you might want to check this book out. (Barnes & Noble on Niagara Falls Boulevard has a copy in the ‘Nature’ section, by the bow window.) It is $35.00 but for any keen wildlife watcher or nature photographer it would be a fine addition to one’s library. The other book by Paul that I know of is called ‘Polar Obsession’, which clearly will be more closely related to his imminent talk (click for further details).